I recently read Bob Shaw’s Other Days, Other Eyes and although I didn’t think that it was a bad novel, it did have a few problems. The main one being that it didn’t hang together particularly well as a self-contained novel. This didn’t stop it from being an enjoyable enough read. It did have a couple of nice ideas and some thought-provoking and still relevant themes. However, I was looking for something a little more satisfying from Bob Shaw. Though his work seems to be mostly unavailable now, he does seem to have been fairly prolific and one would think this implies a reasonable level of regard. The 1975 novel, Orbitsville, winner of the British Science Fiction Award for the best novel, seemed a reasonable place to look for this. 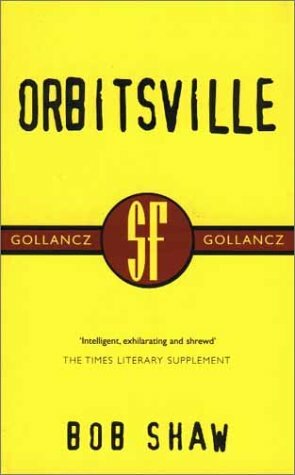 Orbitsville is a ‘Big Dumb Object’ story, similar to Arthur C. Clarke’s Rendezvous With Rama or Larry Niven’s Ringworld. In it, humanity discovers a Dyson Sphere (which they name Orbitsville), this novel being a way of exploring the sense of huge wonder at encountering an object whose internal surface area is equivalent to that of five billion earths. It opens with Vance Garamond, a starship pilot (there’s some hand-wavy explanations of how the interstellar travel of the novel works) finds himself on the run from Elizabeth Lindstrom who, as the President of Spaceflight is the most powerful human alive. She is also quick to temper and tends towards swift and bloody displays of her anger at those who displease her. Garamond, left in charge of her young son, allows the boy a little more freedom than perhaps he should. His fall and death leads to Garamond fleeing as he realises that the consequences for him and his family will be severe. Escaping at the last minute, he takes a ship (on board a spaceship between the stars, Lindstrom’s influence and power are much diluted) to find some safety. Acting on a hunch, he heads towards an area which had pointed to some interesting possibilities. It is here that they discover the Dyson Sphere. Almost unimaginably huge, they realise that it must be hollow and worthy of exploration. After all, this is their job. For Garamond there is the added incentive that a significant discovery could render him more or less untouchable and spare him and his family from Lindstrom’s rage. The huge scale of the sphere makes it seem initially a daunting task for them to discover any of its secrets, though they do deduce where the entrance should be, something confirmed by the presence of a large number of wrecked ships. The novel is, from then on, an exploration of the impact of the Dyson Sphere on humanity. It creates a problem for Lindstrom because – it seems by design – the, until this point, discovery of only one planet suitable for human habitation, gives her and her corporation an immense amount of power as they control the spacelanes to the new world and the parcelling out of land. The discovery of the Dyson Sphere alters this. It’s colossal size means that land is, while not infinite, for the foreseeable future and beyond more than adequate for everyone on an overcrowded and polluted Earth. As human beings start to inhabit Orbitsville, there are a number of problems and conflicts. One of them being that it is already inhabited. The huge scale of the sphere should mean that this is not an issue, although there is a problem with communication and travel in that the faster than light travel to which humanity had become accustomed will not work in the sphere, meaning that expansion isn’t quite so straightforward as one may have thought. Someone, for undoubtedly nefarious ends, has decided to put it about that the inhabitants of the Sphere living close to the humans are dangerous. This leads to an unpleasant growth of fear amongst the humans culminating in unnecessary violence. Part of this stems from some – it seems – fraudulent evidence outside Orbitsville. Garamond and his crew head out to investigate. Unfortunately, on their return their ship is damaged and they – though they engineer a way of avoiding hitting the sphere – are forced into an uncontrolled landing. Although they travel a great distance through the speed they had when they enter the sphere, they cannot get back to their people the same way as their ship won’t work. This forces them to fly back in crafts which will take several years. This gives a little opportunity for some large-scale exploration in the novel, but it also opens up an odd part of the plot. All those who have settled, including his wife and child and Lindstrom, believe him to have died. Lindstrom has, she believes, engineered a way to extract her revenge from Garamond’s son in blood. The main factor being that she has to keep him alive until he reaches the age her boy was at death. This and Garamond’s burning desire to get back to his wife and child, while not completely unbelievable, did seem a little on the odd side to me. The need for land raises something quite interesting in the novel. The job of finding habitable worlds (though apparently not done quite as thoroughly as it might be) is described as a search for lebensraum. A term which conjures up imagery of the Nazis scrabble for land in the east to set up communities of Aryan families. Certainly, the desire of Lindstrom to control the flow of population is based on a desire for a certain level of purity. Not, admittedly, using the racist ideas espoused by the Nazis; but they do seem to wish to create a place free of – as they see it – undesirables. By rationing the land and keeping the cost of emigration high enough, Lindstrom increases her power and influence. Oddly enough, the land that they found in the Sphere, the billions and billions of kilometres of it, due to the way that the Sphere works, encourages the growth of farming communities. Indeed, one of the effects of finding themselves in the Sphere on people is that they find their needs and wants changing. The openness of the land is in stark contrast to the nigh-intolerable conditions found on Earth. Again, this reminded me a little of the Nazi ideal of Germanic farmsteads spreading across the European plain. However, what differs here is that, as noted, the land inside the Sphere is essentially limitless. The ending of scarcity as regards the land, threatens to render Lindstrom’s corporation powerless. Any hope that she has of controlling population transfer is surely under threat. The land is, on the one had priceless for people, on the other it is, in economic terms, essentially worthless. One other thing that struck me early on is the description of Liz Lindstrom. It is noted that, by the time of the novels setting, ‘cosmetic surgery could correct all but the most gross physical defects.’ It seems that she is a bit of an anomaly in this age in that she is, well, a bit ugly. This is presented in Garamond’s thoughts as musing on whether she has the mind of a man and a way of exercising her power. She, her power apparently so unassailable, has no need to ‘correct’ any physical imperfections. It occurs to me, and I could be monumentally wrong here as I can’t think of any concrete examples off the top of my head, that one would tend not to see that so much in SF now. Yes, you might see body modifications, or the use of technology to ensure longevity and so on, but the idea that there is a definite ideal to which all should aspire in physical attractiveness seems a little in the past (when, of course, this novel was written). So not to chastise Shaw for this. It was just a thought; one which may or not be correct. Guessing not. This was a definitely a little more coherent as a novel than my previous excursion into Shaw territory and, while a little flawed, was an enjoyable read. The Big Dumb Object aspect of it was certainly enjoyable and, beyond that, it had plenty of ideas crammed into a relatively slim volume. The idea of an packed and dirty world is a fairly common one in science fiction and one which still has relevance. The characters were mostly fairly unsympathetic and I’m not convinced that they really saw that much development over the length of the novel, beyond the feeling that the opportunity to make a home in Orbitsville was too good to pass up. It really feels as though they are there simply to present that aspect of the novel. But, hey, it’s hard-SF and at least he kept it snappy. As I’ve mentioned before, I don’t have a particular problem with unsympathetic characters, provided that they aren’t moustache-twirling villains or, worse, (for example) racist stereotypes but I do realise that some find it hard to read books where they struggle to identify with any of the characters. If you fancy a Big Dumb Object story, you can do worse than this. I did find the chase back to the beachhead at the entrance a little daft and almost superfluous, but none of this was catastrophic. This entry was posted in Review and tagged bob shaw, british masterworks, novel, sf. Bookmark the permalink. “more than adequate for everyone on an overcrowded and polluted Earth” — YAY — more overcrowded earth material for the continuing exploration of the theme! Haha, aye. It’s not really explored, though it is sort of central to it as it’s key to Lindstrom’s power and basically everything that happens in the novel flows from that pressure. Yeah – I’ve sort of enjoyed his stuff thus far. It’s interesting; he certainly isn’t bad at ideas, but I’m not totally convinced by his ability to write novels. That said, there is worse than this that gets remembered on the reputation of the author alone… For unjustly forgotten stuff… I’ve an Ian Watson review in preparation. He is ace. Still on the scene too. He did a couple of sequels to this – I have Orbitsville Departure, be interesting to see how he handled following up the first one. I haven’t read an Ian Watson novel so I’m looking forward to your review. I think that says a good deal more about your frame of reference than Shaw’s. The ideal of an agrarian utopia is hardly unique to Naziism – it might as easily have reminded you of United State’s manifest-destiny-driven expansion across the American plains (or the dream of 40 acres and a mule) or Morris’s Nowhere or intentional communities such as the Amish or any number of Arcadian utopias from Sidney back to (at least) Hesiod. Well, yes, I’m not going to disagree with that. I think that Shaw’s decision to use the word ‘lebensraum‘ repeatedly is what pushed me towards the idea of an empire spreading to the Urals more than any other utopian agrarian ideals and I don’t think it’s a problem with the novel. I didn’t mean to imply that it was unique to Nazism! I found your review to be highly enjoyable, and described aspects of the book, such as the cultural and political impact of the vast amounts of space, far better than Shaw did himself. My general feel for the novel is that it was pulp fiction shoe-horned into a grand concept theme. Despite it being easy to read, enjoyable even, many of the flaws remain with little development beyond the basic plot; which is unfortunate, because the two big SF ideas were the Dyson Sphere as well as the aliens who inhabited it. It would have been amazing to have found out more about those aliens and their history with the sphere up close, rather than being there in service of the action plot.